Many people think that a spider web and a cobweb are exactly the same. However, this is actually a misconception. If you are one of the many who do not know what sets the two terms apart, this article is for you. In this article, we will explain why a spider web and a cobweb are different. A spider web, also called “spider’s web” and alternatively spelled “spiderweb,” is a net-like construction built by spiders. Spiders use spider webs to trap their prey so they do not have to exert a lot of energy chasing down insects. They also use their webs to protect themselves and their eggs from predators such as large insects and birds. Spiders use their spinneret gland, a tiny tubular appendage located in the upper part of their abdomen, to produce the silk needed for the construction of the web. Depending on the species, a spider can have four to six spinnerets, with each spinneret capable of producing different kinds of silk for different uses. For instance, a spinneret can produce sticky silk beneficial for trapping insects or a strong, fine thread to encase it. The silk used in spider webs is made of protein fiber and is stored as a fluid which then hardens upon exposure to air. Because spiders use a lot of energy to produce the silk thread for their web, some species of spiders eat their own web to regain their energy. 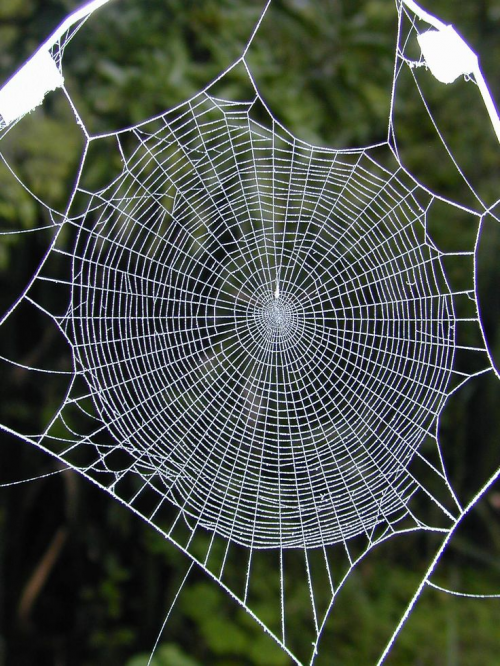 Many centuries ago, spider webs were used as wound pads to stop bleeding. Because they contain a high amount of vitamin K, they aid in clotting blood. The word cobweb is derived from the old English term “coppe” which means “spider.” It is a kind of spider web that is built specifically by cobweb spiders or comb-footed spiders belonging to the Theridiidae family. Cobweb spiders have the unique ability to build three-dimensional web architectures which sometimes look tangled (thus, the term tangled web). Like the other kinds of spider webs, a cobweb is primarily used to trap insects for food and for protection. 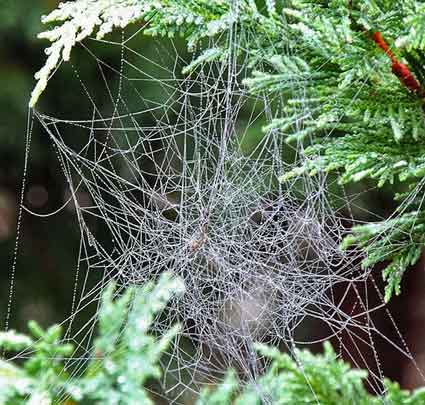 In more colloquial usage, the term “cobweb” is also used to refer to webs that have collected dust and dirt or a spider web that has been abandoned or no longer used by spiders. In the 16th century in the Austrian Tyrolean Alps, cobwebs were wound and then layered to create a fabric which artists used for painting. These “cobweb paintings” were created by applying color and making engravings to the cobwebs. Centuries ago, cobwebs were also used to heal cuts and wounds quickly. What, then, is the difference between a spider web and a cobweb? A spider web is a general term that refers to the net-like structure made of proteinaceous silk from the spinneret glands of the spiders. A cobweb, on the other hand, is a type of three-dimensional or “tangled” spider web which is specifically built by cobweb spiders or comb-footed spiders. Additionally, the term “cobweb” also refers to abandoned spider webs that have collected dirt and dust.